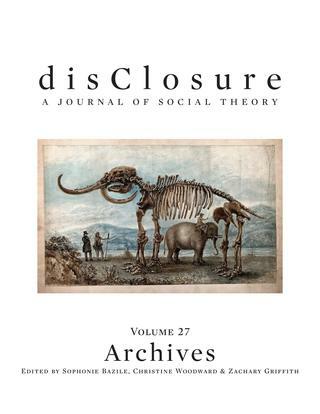 disClosure is an annual thematic publication dedicated to investigating and stimulating interest in new directions in contemporary social theory. By encouraging submissions from a variety of disciplinary, geographical, and theoretical perspective and genres, the journal seeks to expand the nature of what is studied by the academy and how it is studied. In an effort to construct new approaches to form and content, we encourage submissions that employ innovative writing styles as well as formal scholarly work. The journal annually publishes articles, art, creative writing, interviews, and book reviews. Students are responsible for all aspects of the journal, from the solicitation and review of manuscripts, art work, and poetry, to correspondence, publicity, distribution, fund-raising, book reviewing, and preparation of a camera-ready copy. Each issue has a Chief Editor, Managing Editor, Review Editor, and Art Editor who oversee the collective's efforts; and Committee members supply advice for the entire operation. disClosure is housed in the social theory office and produced on the state of the art computer equipment available there. The journal also has an internationally renowned editorial board (see below) that assists in the evaluation of submissions. disClosure is a refereed journal produced in conjunction with the Committee on Social Theory at the University of Kentucky. Funding was provided by: the Office of the Vice President for Research, the College of Arts and Sciences, the Graduate School, and the Student Government Association.